Charles Marville (1816-1879) is considered one of the masters of French 19th century photography and is in particular known for his exceptionally beautiful large-format albumen prints documenting Paris during the transformation of the city under Baron Georges-Eugene Haussmann. 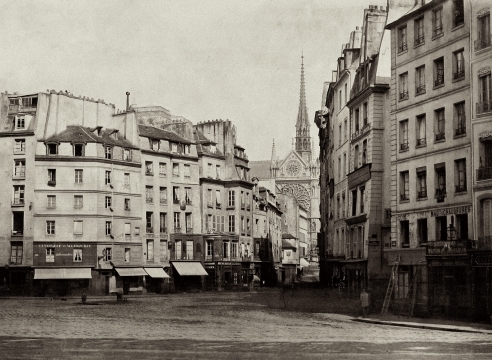 After working as the official photographer for the Louvre during the 1850s, Marville was commissioned in the 1860s to produce a series of 425 views of the city, the “Album of Old Paris”. Beyond a simple record of the city this was considered a history of the Parisian streets before their destruction and consequent renovation and expansion under Haussmann. Marville’s dynamic compositions filled with light and shadow preserved the small streets and corners of old Paris destined to be replaced.